The rhythmic crashing of waves upon the shore, a landscape dominated by water and sky, and the sun’s penetrating warmth: all are reasons I adore the ocean. The horizon stretches endlessly, intersecting with the very curve of the earth. How naturally worship comes! What a powerful, majestic, God I have! He is grace. He is mercy. These are not unusual thoughts when I dwell on the depth and plenitude of the sea. Of all the wonders of the beach, I suppose I don’t often gaze at sand, however. It was a windy day, the precursor to rain and storms. I lay on the beach towel, soaking in the rays, yet aware of the more than average wind. Sighing, I closed my book, and propped my chin on folded arms. From my vantage point, I had an up close and personal, lavish view of nothing more than sand. Alone with my thoughts, I contemplated “the long dreaded day.” Two years, eight months, and three days I was married to Jonathan Atkins. Two years, eight months, and three days had he been gone. As always on significant days, my thoughts swirled with the supposed implications. I’m facing a day most widows never experience. So many get to be with their husbands for decades. Does it mean he was just a minor character in the story of my life? Does it mean our marriage is invalid because it was short? Does it mean he no longer influences me and others? Sand whirled, reacting to the force of the wind. My face inches above the beach, I gazed at an indiscernible pattern, noticing individual grains whisked along by something outside itself. If I tried to count the grains of sand in the square foot in front of me, it wouldn’t take long to realize the futility of my endeavor. How ridiculously more impossible to number all the grains of sand on every beach and under every ocean! 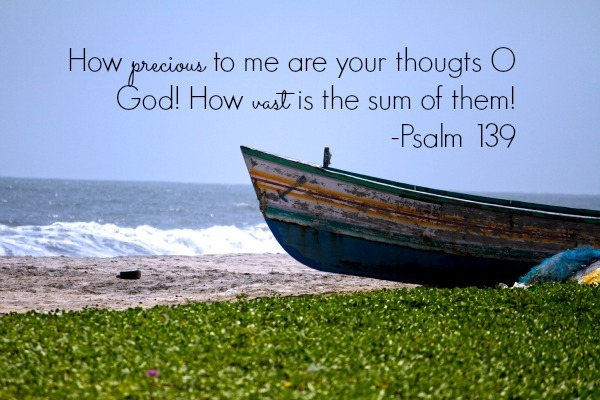 But this is the best I can do to rightly imagine the number of God’s thoughts toward his own. I cannot fathom their exhaustive nature. How truly precious! His thoughts about me are vast. He deals with me in more unique and intimate ways than any human ever could. By God I am thoroughly known and thoroughly loved. I contemplated the true implications. Jon being gone longer than we were married doesn’t change anything. He still has lasting influence. He’s still a major character. New chapters are good things. For without them, there would be no forward plot, no grand themes, no riveting climax. Before I was born God established the course of my life, a sub plot in His epic redemptive tale. He was sovereign over the length of days I had with Jon. He orchestrated our meeting, and His timing was perfect. To wish for more time, is at its root to doubt God’s character. It is to doubt the vast, detailed, and thoroughly perfect nature of His plans. I closed my eyes, breathed in the salty air, and rested in the beauty of being loved and being known. On a day I long dreaded, I realized I had nothing to fear. Stirred anew by the beauty of the gospel, an overwhelming sense of illumination spread like fire in my heart. Joy and sorrow intermingled, two cords of the same braid. I call it a beautiful crushing. It’s the place where God reminds me of my desperate need for Him, and just how much I’ve been given in Jesus. The worship gathering continued, but I lingered, astonished by a singular concept. I no longer belong to my husband. One day I may belong to another. I already belong to Jesus. I’ve read this passage countless times since Jon died, but never have its contents seemed so radical. Sorrow and joy wove an intricate dance, somehow moving harmoniously together. I still miss belonging to Jon, but joy swelled at thoughts of renewal, reversal, and redemption. Joy blossomed at the idea of belonging to another. A year ago, sorrow would have vastly outweighed joy, but now they feel more compatible. I’ve long since realized that counter to cultural expectations, joy and sorrow may be equally present. The ultimate oxymoron, one does not necessarily exclude the other. For Christ had deep sorrow over the weight of sin, but also deep abiding joy to do the Father’s will. 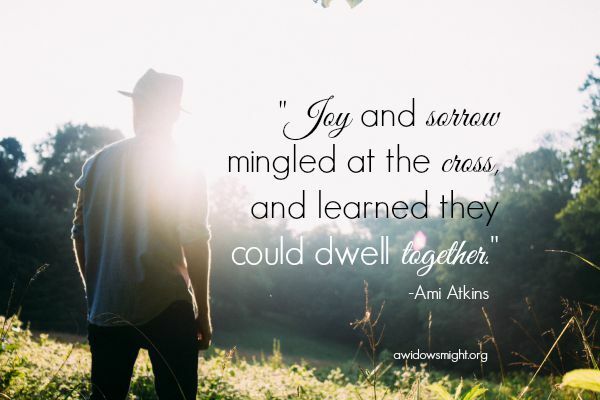 Joy and sorrow mingled at the cross, and learned they could dwell together. And if I didn’t know death, I wouldn’t understand their harmony. Joy and sorrow: a profound illustration of the gospel, yet death and remarriage exemplify it further. While Jon was here, we were bound to each other by a covenant made before God and man. And of course, I cherished that covenant. As hard as it is to process, at his death, we were no longer bound together. Clearly the analogy breaks down, for marriage to Jon was not sin, nor was I captive to him. But the application is clear. I once was bound to sin. But now I belong to Another. 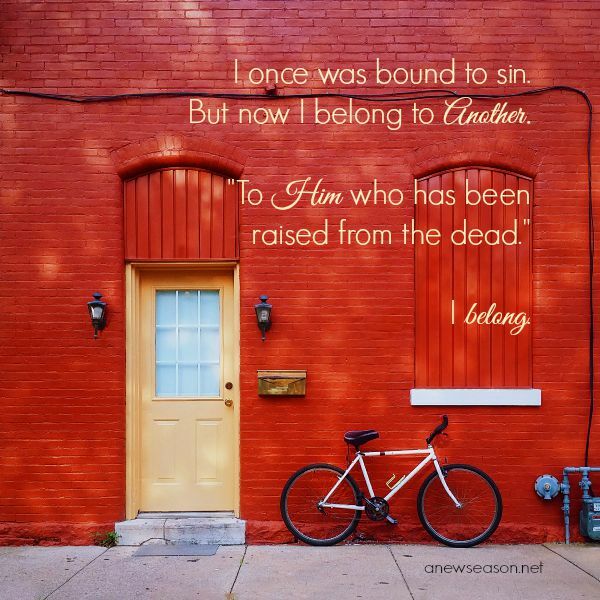 I belong to “Him who has been raised from the dead,” free from the law’s condemnation and sin’s inescapable vice. In marriage Jon was mine and I was his. How I loved belonging to him and miss belonging to him! And how I long to belong to another again someday. 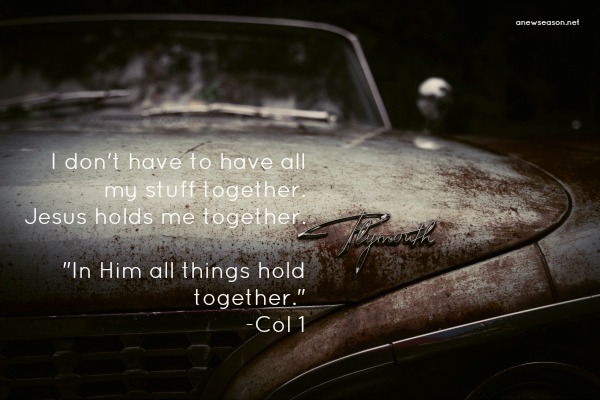 However, infinitely more precious than belonging to a husband, I belong to Jesus. I am Christ’s and He is mine. I’m not guaranteed remarriage, but I already belong. Joy and Sorrow. Death and thoughts of remarriage: an intermingling I wouldn’t have chosen, but I marvel at such a beautiful dance. Lord, no longer belonging to a husband is a hard thing to grapple. Sorrow. But to belong to You is inestimably better! Joy. In Jesus, I belong. And I always will belong! Oh, God, use the intermingling of sorrow and joy to draw me ever closer to you; through them I see all that Jesus accomplished. I marvel that Jesus embraced sorrow, so I would have joy.